Dr. Sophia Bulucea relies on the best available research evidence, and draws from her vast clinical expertise—more than ten years practicing here in Cupertino. She believes that orthodontic treatment should be individually tailored to every patient. She takes into consideration her patients’ preference, concept of aesthetics, and values when creating a treatment plan. 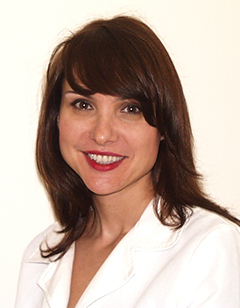 Dr. Bulucea was awarded her Certificate in Orthodontics as well as a Master’s in Dental Sciences at the Indiana-Purdue School of Dentistry in 2003. Previously, she was awarded her Doctor of Dental Medicine from the University of Connecticut School of Dental Medicine. She completed her pre-doctoral requirements in addition to a Bachelor of Science degree in Biochemistry at the University of California, Davis. When she’s not in the office, Dr. Bulucea can be found in her garden. Her current challenge is changing it to a California-native garden to conserve water. She also enjoys art, design, cooking, and being with her family.